My life is slowly returning to normal. The Knicks managed to pretty much get blown out by the lowly Nets last night. Tonight will be a once-in-a-Blue-Moon New Year. For those of you who may not know, a Blue Moon is the second full moon occuring in a single month. And tonight will be the second full moon this month. The last time this happened to usher in a New Year was in 1990. See, this is why you read this blog, for the totally useless arcane knowledge that you at times, very rarely, glean. But what does "glean" really mean? Originally it meant the act of collecting leftover crops from a farmers' fields after they have been commercially harvested, or in fields where it is not economically profitable to harvest. In the case of birds, it means to collect insects from the surface of a leaf. "Dumpster Diving" is sometimes refered to as "Garbage Gleaning." And, with those parting thoughts, I will leave you with wishes for the happiest of a New Year, or, at least, the happiest in a blue moon. Now I am off to make Rice Krispie Squares. I find that if you lace them with Vanilla Vodka it takes the edge off the sugar high and keeps my little neices calmer. Of course I also spike their hot chocolate with peppermint schnapps. They love their Uncle Barman. Well, actually, that would have been a stretch. However, there was an article in this morning's New York Daily News about a woman who claims she was injured when a moosehead fell off a wall and hit her in the head. Now this happened in the White Slab Palace, a Scandinavian-themed bar on Delancey St. on the Lower East Side of Manhattan. Interestingly, however, there was something strangely familiar about the picture of the "moose" that accompanied the article. Namely, it wasn't a moose, it was a caribou. Barman, who has an amazing ability to relate obscure thoughts (but has a hard time following simple directions like put away the dishes), immediately thought of the Good Bar & Grill in Chinatown where he initially mistook a caribou head for a moosehead. And, as it turns out, Annika Sundvik, an art gallery owner, just opened White Slab Palace last February. But, wait, Annika Sundvik also owned, drumroll please, Good Bar & Grill. 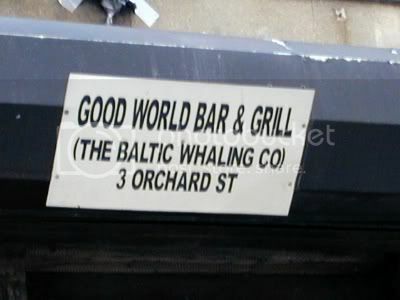 Sadly, the Good Bar & Grill has closed. To make room for condominiums, I do believe. Sad, so very sad. 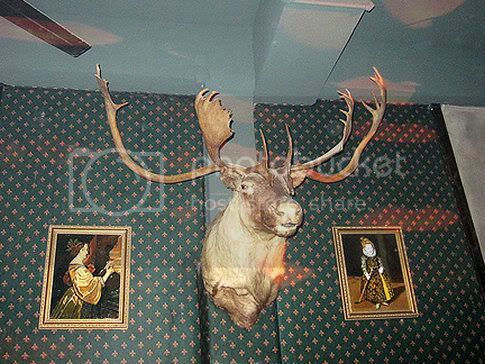 But, the very caribou head that appears in my post (back in July of 2005) of the Good Bar & Grill was, apparently, relocated to the White Slab Palace where it, allegedly, fell on someone's head. If you missed the sign, and it is easy to do, here is a closer look. This isn't the easiest place to find, but well worth the effort. 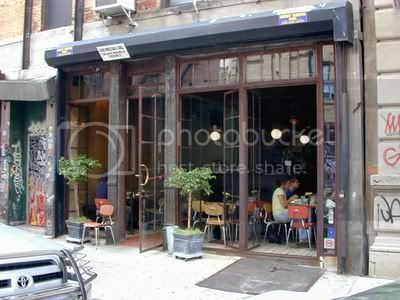 It is in the part of Chinatown not as popular, on the east side of the Bowery. Canal Street, the main drag through Chinatown, takes a bit of a hook under the Manhattan Bridge and if you just follow it for about six blocks you come to Orchard. Take a right and go to Number 3 and there you are. 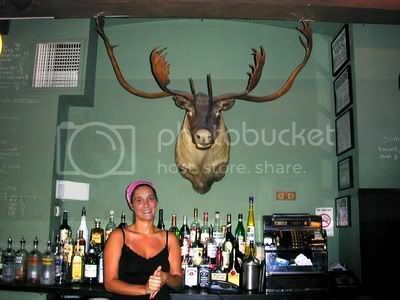 This is the perfect place if drinking under the baleful eye of a dead caribou is what you crave. I know, I know, originally I said this was a moose but I was wrong, as many people pointed out to me. A black stone topped bar with unusually high, and I do mean high, black metal barstools with black cloth seats. I would hate to fall of one of these babies, but the bartender said it has happened. Light yellow and green painted plaster walls with significant chippage. An old dark pea-soup green painted tin ceiling with exposed pipes for the sprinklers and wiring conduits. Gives the place kind of a funky look. Old greenish white globe lights hang over the bar and the flooring is old wood. There is just a minimal setup behind the bar but they have a surprisingly large beer selection written in fading chalk on the green wall behind the bar. How about a Harvistouns Old Engine Oil from Scotland? Sounds yummy, doesn't it? They also have a very extensive wine selection and interesting items on the menu such as a rabbit and fois gras terrine with blueberry pickled bok choy as an appetizer. The place is owned by Swedes so they have four kinds of aquavit available and you can buy it by the bottle for only ninety-five bucks. No lutefisk though. Thank goodness for little things. Anna said they would have it but it just smelled up the place to badly. I know for a fact that is true. My father loved lutefisk and I would flee the house on the few occasions my mother prepared it. Little round tables with orange and yellow chrome and plastic chairs are strewn about the place. Low blank benches with black cushions line the wall opposite the bar and small square tables sit in front of it. There are floor to ceiling windows in the front and a neat little back yard with picnic tables for outdoor eating. I had a draft Bolleke. This is an everyday beer in Antwerp, easy to drink, and not too bitter, the red-brown ale has almost a cinnamon spice hint to its flavor. Actually, a bolleke is a bell-shaped high-stemmed glass that is used in Antwerp to serve any highly-fermented beer but generally means the beer that I had, which is actually a De Koninck. And, yes, it was served in the appropriate glass. Let's start with the Jets. They actually have a shot at making the playoffs. All they have to do is beat the Bengals on Sunday and they are in. More surprisingly, the early line makes them 10 point favorites. If you would have told me such a thing was possible a month ago I would have told you that you were crazy. Now, onto the Knicks. I am actually starting to warm up to them again. Granted, they aren't likely to go anywhere this year, but they are playing better and winning more than half the time. And the new coach seems to know what he is doing. I totally agree with him sitting Curry and if Nate doesn't play like the coach wants, then keep him sitting too until he learns how. Nate could be really good one day if he ever settles down. But, most surprisingly, after last night's Vikings/Bears game I actually felt sorry for Brett Favre. He brings the Vikings back to tie the game (should have been ahead except for a missed point after) with about five minutes to play, Bears then run the kick-off back 59 yards leading to a quick touchdown, and then with just 16 seconds left, Brett manages to tie the game up again sending it into overtime. Sadly, the Bears score first after recovering a fumble by Adrian Peterson and the Vikings lose. Remember, if not for a missed point after the Vikings would have won in regulation. Now, if someone told me that one day I would actually feel sorry for Brett Favre, I would have said they were not only crazy, but an idiot as well. Now you can see why my life is in a state of total disarray. My friend Tom, who was with the group in Las Vegas, is a regular at The Sawmill Saloon, a bar and restaurant in Virginia, Minnesota. I have been there many times myself, usually on the way to visit my friends Bruce and Donna who live in International Falls. It seems as though The Sawmill Saloon now puts out a calendar, and Tom wanted me to share part of it with you. Perhaps he will send me a 2010 update. For more information about The Sawmill Saloon, just click on the picture. It is always fun to click on Weather and find out what life would be like if you were living in Virginia, Minnesota. Kind of a balmy 7 above the last I looked, but then that was in July. Just kidding, it was actually about 6:30 PM today.